Your favorite summer intern is home from the Bayou to get you ready for the weekend. Basketball isn’t the only Top 25 matchup this weekend as the No. 17 Gym Cats take on reigning SEC Champ LSU in a huge home meet. 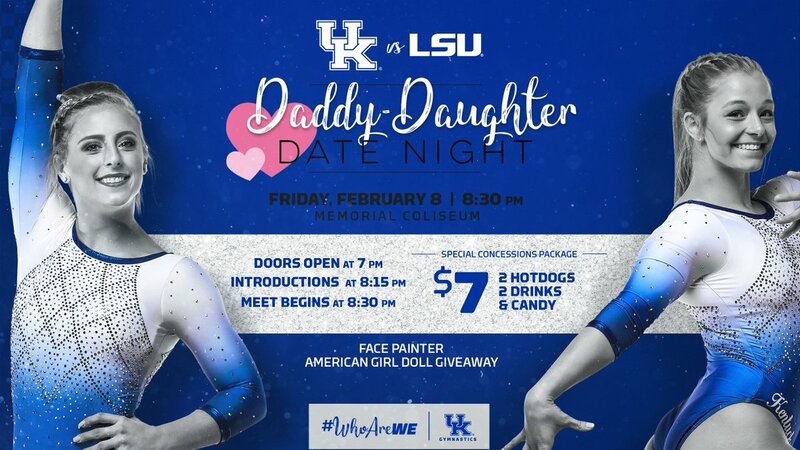 Friday is Daddy-Daughter Date Night at Memorial Coliseum with special concession packages and fun activities for the kids before introductions at 8:15 p.m. The meet will be televised on the SEC Network and tickets are only $10 to watch Kentucky Gymnastics take on a Top 5 team in Lexington. Last week Kentucky lost 196.125 – 196.000 at home to No. 11 Auburn. They’re currently 2-2 overall and 1-2 in the SEC, and the Gym Cats have yet to leave the top 20 with consistent scores in the 196.000 range. Senior powerhouse Sidney Dukes came in second in the all-around with a 39.325 and season highs on both bars and floor, and Head Coach Tim Garrison is confident going forward. After the meet, Garrison was open with how he feels about their progress, saying, “We’re a really good team, being patient and working our way through some lineups and getting some people back healthy. I feel good about where we are at this point.” This season is his eighth in Lexington and he’s receiving national praise for his success. Last season Garrison led the team to an NCAA Championship appearance and a night slot in the SEC Championship, earning him the coveted NACGC/W National Coach of the Year. On the other hand, gymnastics powerhouse LSU has been putting up an average of 197.015 but has fallen to major opponents like No. 2 Florida. Senior Sarah Finnegan has earned three SEC Gymnast of the Week honors and has gone 5-for-5 in the all-around. Head Coach of 41 years D-D Breaux has expressed frustration with the team’s performance, but after beating out NC State 197.150-195.375 feels that they are on the right path. With floor powerhouse (and daughter of 1984 Olympic Champion Mary Lou Retton) McKenna Kelley back from injury and former national team member Lexie Priessman near her hometown of Cincinnati, the Cats are in for a challenge on Friday. Last year in BR an improved Kentucky team put up a fight, losing by only half a point overall. Looking back on the series, LSU leads a whopping 79-5-0 with the most recent loss being in 2011. Last time the Tigers came to Lexington, NCAA Floor Champion Ashleigh Gnat put up a perfect ten on vault and LSU won by nearly two points. 2019 has already proven to be a special season for Kentucky. In Gainesville they put up the third highest score in program history. Mollie Korth and Sidney Dukes have made a name for themselves on the national stage and Coach Garrison is on a roll in the post-season. It will be exciting to see how the Cats fare at home against a top tier program like LSU and while a win would be shocking, a 196.000 or higher isn’t out of the question to improve their national standing both on paper and in the world of the Gym-ternet. Get tickets for Friday’s meet here.